Over 1,700,000+ domains, 20,000+ new customers a month, 16+ years of web hosting experience since 1996, a 20,000 square foot dedicated data center, a nationwide fiber network, 100% in-house on-site US based staff, 24/7 support, and an ongoing commitment to innovate and upgrade their technology to provide the most outstanding services at the best possible price. That’s Bluehost — one of the best and most versatile shared web hosting companies in the industry today. 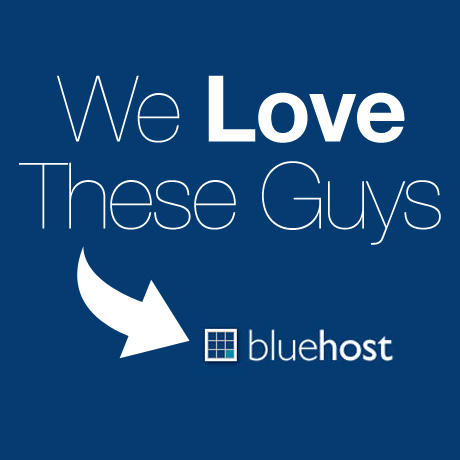 Exactly Why Do We love Bluehost? “Trop de choix tue le choix” or “Too many choices, kills the choice.” Sometimes having too many choices can lead to indecision. Bluehost’s approach to its pricing scheme is simple and straightforward. Their affordable one-plan fits all web hosting package makes it easy for prospective customers, especially newbies, to cover all their basic hosting requirements including extra benefits (eg. no setup fees, unlimited domains and subdomains, unlimited disk space, etc.) that will make even the more demanding clients quite happy. Small to medium-sized business owners and individual website owners enjoy full functionality and top-notch useful features even on a small budget in every Bluehost package. Take advantage of Bluehost’s special promotion rates to see for yourself. Customers can choose from any of the 3, 6, 12, and 24-months prepayment web hosting packages they have backed by an anytime money back guarantee commitment. Bluehost’s free 1-Click Scripts Installs using SimpleScripts gives you the power to setup and manage single personal web pages or more complex websites using content management systems like WordPress, Drupal, Joomla and many other software applications. Unlimited disk storage, unlimited monthly data transfer, unlimited domains in one account, one free domain name, 2500 email accounts, 50 MySQL databases, free cPanel, free SimpleScripts, mirrored backups, no hidden fees. On top of all that, they’ve also developed their own proprietary 100% free Hosting Resource Protection solution to protect customers from slowdowns caused by abusive users that consume too much CPU, memory or disk I/O operations. What’s not to love? Bluehost is WordPress.org’s hosting provider of choice since 2005 and Joomla’s since 2009. It has been reported recently as the best hosting provider for Drupal in 2012 and also the recommended web host for websites developed using the Ruby Rails technology. Bluehost’s uptime record is one of the most reliable in the industry. Their huge investment on infrastructure and the construction of their own data center running on their own customized Linux kernel is a public declaration of their commitment to provide the best services possible. This set up gives them the flexibility and muscle to constrain elements that might affect the continuous delivery of their service. Bluehost is also equipped with world class technology and several backup procedures (UPS power backup, diesel generator backup power, courtesy site backup) to assure customers that the percentage of downtime, which can still occur despite all necessary precautions, is kept at a minimum. Current year uptime statistics average at 99. 99% (according to web-hostingreview dot com and webhostingstuff dot com) in keeping with their 99.99% hosting uptime commitment. Customer support remains to be the most important ingredient for anyone who runs a business especially on the Internet. The absence, lack, or unreasonable delay of customer support can make or break any online business especially if complaints about it spreads rapidly and creates a negative impression on potential customers. Bluehost offers 24/7 phone (toll-free), live chat, email and ticket support, and a user forum to provide customers with timely and prompt technical support as needed. Bluehost is also committed to a 30-second targeted hold time to ensure quick resolution to any issues brought to their attention . Their excellent and extensive database of articles is another support resource that can be used as reference for questions and guidance. Easy to use, organized and intuitive customized cPanel that allows you to manage, control, monitor your website from virtually anywhere. Website builder options using: CMS like WordPress, Drupal and Joomla; thousands of web templates; or software like SohoLaunch, Zazavi, etc. Affiliate and Reseller program gives you the opportunity to make money. You can refer others and earn an affiliate commission or you can also start your own hosting company and resell Bluehost’s web hosting services under your own brand. E-commerce options — If you plan to put up an E-commerce site then security and data encryption are key elements you need to consider. Every Bluehost plan includes an SSL Secure Server, OpenPGP/GPG Encryption, password protected directories along with a variety of shopping carts to choose from. These features allows your business to offer secure ordering transactions and other ecommerce options at no additional cost to you. $100 Free Google Credit — Bluehost and Google have teamed up to provide new Adwords account holders a $100 credit which they can use for advertisement under Google’s Adwords Program. It’s a great way to introduce your website to the Internet at absolutely zero cost. Anytime Money Back Guarantee — Unlike other web hosting packages, Bluehost customers can cancel their accounts any time and ask for a prorated refund. Running an online business where you need to deliver a product or a service is all about speed, service and timeliness. It’s extremely important to choose a reliable web host provider with a proven track record. Cheap and affordable hosting is good but not at the expense of the money you will lose on a website that is inaccessible because it is slow loading or because of constant server downtime. Of course, there really is no perfect web host provider and every website owner has his or her own experience and preference as to which one is the best. Bluehost has been consistently in the top web hosting providers list for a number of years. Like all growing businesses, they have had a few hiccups along the way- downtime and all but they have been steadfast and unwavering in their mission and vision as a company. It is this commitment to improve, innovate, and involve their customers to be part of their growth that makes them a company worth recommending. More than 1,700,000 customers seem to think so. Check out Bluehost today.